‘Oops, I didn’t do it again’… Nobody ever writes a song about that. Even though many people struggle with not doing what they want to do, or what they need to do. 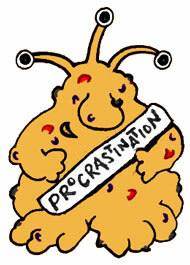 ‘Stop procrastinating now!’ wants you to start doing the things in life that matter to you. It wants to make it easy for you to do so, and preferably fun too. … I have a free e-course available. And you can work with me one on one for even more powerful results. Read more about this on my new website.